Fire has engulfed a large section of the exclusion zone around the destroyed Chernobyl nuclear plant in Ukraine. It is unclear if the blaze has struck parts of the zone heavily contaminated by radiation from the 1986 reactor explosion, although authorities said the flames swept through about 130 hectares (half a square mile). 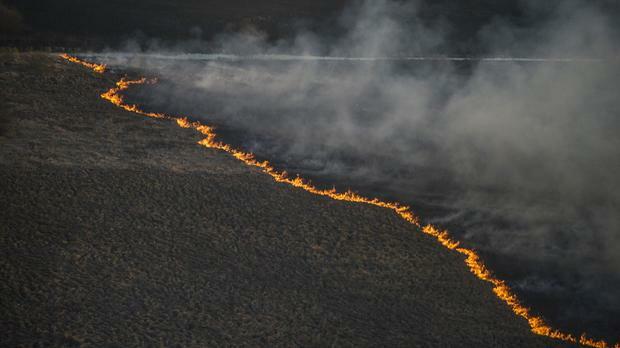 Russian news agency Tass quoted Ukrainian official Yuri Antipov, who is in charge of the exclusion zone, as saying the fire started on Monday evening and was brought under control by late morning on Tuesday. A 20-mile zone around the plant is off-limits to most people except for workers constructing a new shelter to cover the destroyed reactor's building, and to visitors on short trips. The explosion and fire in 1986 left some sections of the zone heavily contaminated, while other parts were less damaged. Radiation levels in the area have not changed, according to Victoria Ruban, a Kiev representative of the Ukrainian State Service. This is the second fire in the off-limits zone in three months. A forest fire in April swept through 400 hectares and was described as the first blaze in the area in more than two decades.